The Fast Track High court in Accra today sat for the second hearing of the case submitted by plaintiffs Food Sovereignty Ghana (FSG) against the Ministry of Food & Agriculture and the National Biosafety Committee. The case was first heard on February 17th of this year and was adjourned till Tuesday 3rd March as the Judge, His Lordship Anthony Kwadwo Yeboah requested that all parties to the case submit written documents rather than allow verbal presentations in court. Lawyer for the plaintiffs George Tetteh Wayo informed the court that there were some clerical omissions in one of the submitted documents and prayed the court to allow him submit the corrected copies. The judge however turned down the request and rather directed that the case be refilled to avoid any further complications. The Attorney General’s (AG) representative requested that the court join the National Biosafety Authority as well as the AG’s department to the case as 3rd and 4th defendants respectively. Lawyer for the plaintiffs agreed with the request. Judge Kwadwo Yeboah directed that since a request for interlocutory injunction had already been applied for by the plaintiffs, it therefore meant that there would be a temporary halt on any further commercialization and development of GMO until the case is concluded. 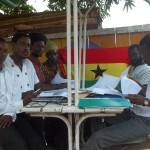 Food Sovereignty Ghana is a grass-roots movement of Ghanaians, home and abroad, dedicated to the promotion of food sovereignty in Ghana. FSG still maintains that the National Biosfety Committee has unlawfully been operating in the place of a National Biosafety Authority and is in clear breach of the provisions of the Biosafety Act 2011 Act (831), as regards the need for public awareness and participation in decisions affecting the release of genetically modified organisms into the environment. The case has been adjourned to April 2, 2015 at the fast track High Court in Accra. For Life, the Environment and Social Justice!